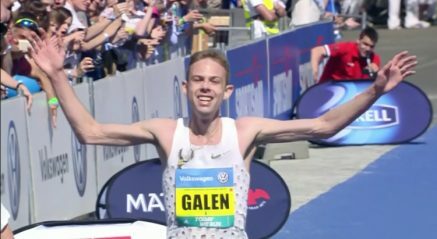 6th May 2018 – Galen Rupp (USA) reaffirmed his marathon pedigree by taking victory in Prague. Three weeks ago in Boston there was disappointment as the testing weather conditions put pay to his challenge, but here nothing was going to stop him as he confidently ran away from the field in the final stages of the race. A large lead group passed halfway in 63:01 but this was soon whittled down to just two with Galen and Ethiopian rival Sisay Lemma fighting for the win. With four miles to run Galen made a decisive move and broke away from Lemma crossing the line in personal best figures of 2:06:07. Duncan Maiyo (KEN) finished in seventh position. At the Great Birmingham 10k Moses Kipsiro (UGA) made a very welcome return to action and showed that he still has a lot to offer. He ran virtually unchallenged to victory in a time of 29:06 on the twisting and undulating course.